Tend to your very own garden and unravel an exciting story in Family Yards: Memories Album – a casual match-3 game about family, making friends and exploding fruit bowls. Help Alice and her family fix their garden, find the missing family pictures and restore their dream house. 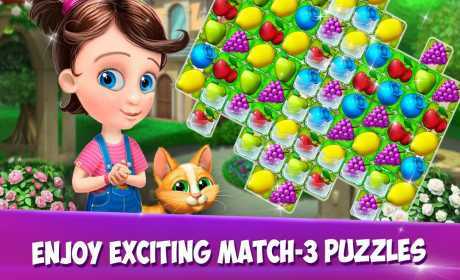 Solve challenging and fun match three puzzles to reveal more parts of your family garden, and then decorate them as you like! Collect hidden photos to complete the family album, meet and work together with fun-loving in-game characters, and unlock new boosters and quests. What are you waiting for? Go on a gardening adventure and restore your beautiful family yard! 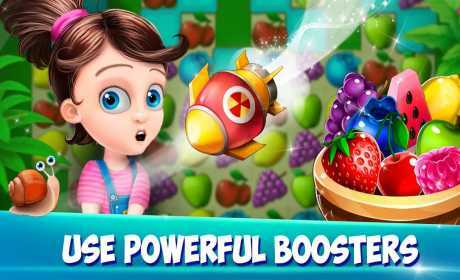 ✿ Hundreds of addictive match-3 levels: swap, match and crush all the fruit you want! 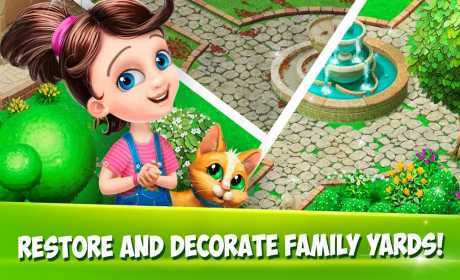 ✿ Decorate the family garden to restore it to its original beauty! ✿ Explore different areas of the yards, each with its own unique look! ✿ Solve daily challenges to unlock new outfits for Alice! ✿ Follow the story of Alice and her Grandparents and uncover the family secrets! ✿ Meet fun characters that will help you through the story! ✿ Invite your Facebook friends over to play in your yard! ✿ We also have a cute kitten to brighten your day! NOTE: Family Yards: Memories Album is completely free to play, but some in-game items can be purchased for real money. You can switch off the in-game purchase option in device settings. You need an Internet connection to play this game.